The original market place as you probably know was in High Green, which is now Queen Square; and was long a nuisance to the inhabitants and a great trial to the health of the Butchers, green-grocers etc, who possessed the stalls. 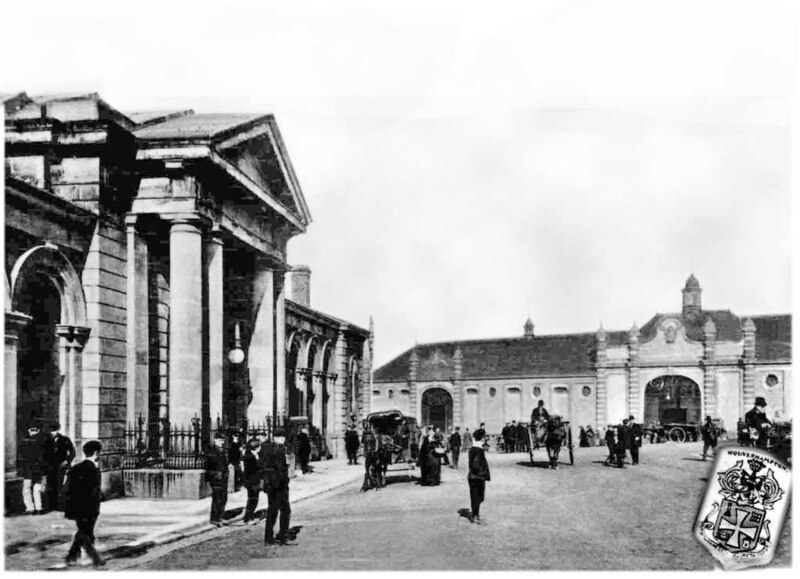 So in 1848, the newly elected Town Council agreed that a new General Market Hall was necessary for the town. 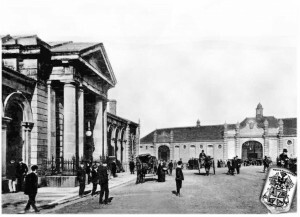 This was opened in march 1853 alongside its aspiring neighbour; the Exchange on the west front of St Peters Church, where it remained for 100 years. If I tried to describe the feeling I had every time I entered the old retail market in Cheapside with my mother during the war, you’d think I was talking about entering the Coliseum in Rome, because it was certainly built on a similar grand scale. On its two main fronts, the east and west ones, the entrances were enriched with many Corinthian and Doric columns. The pictures here can only give you a glimpse of this magnificent interior so full of variety and atmosphere, with a bustling spirit of life. 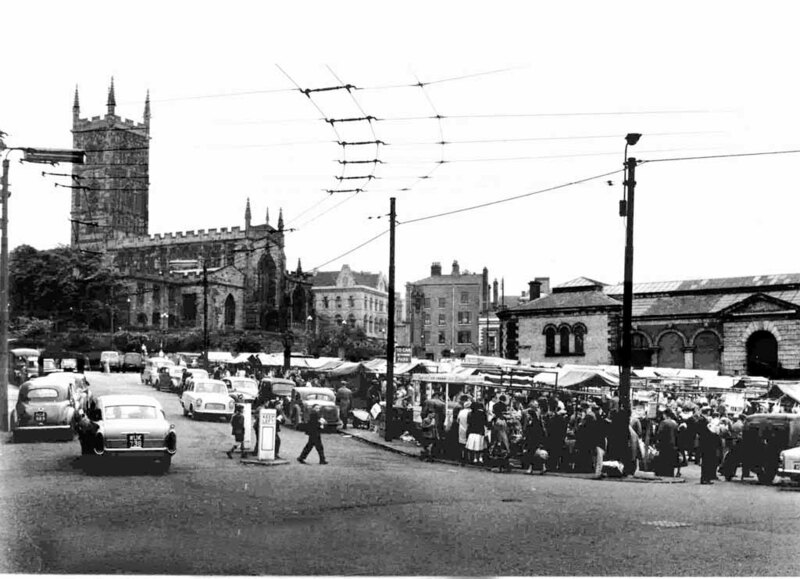 But every one over fifty will have their own memories of the markets I just hope my pictures will help to take you back a bit. 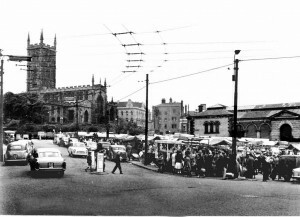 In 1953 the handsome structure pictured on the right celebrated its Centenary, and who would have dreamt it would be gone in just ten more short years, but Sainsburys had just recently opened the first supermarket in London and for the days of the old traditional markets, the writing was on the wall. A learned gent said, at one time ‘There are no good old days, nor bad old days, just changing times where the new benefits are always at the expense of losses in other ways’. 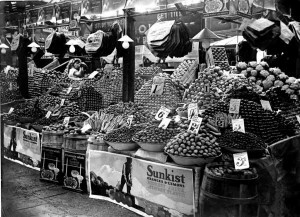 Take the varieties of fruit and veg available nowadays in the supermarkets, you might say, we are spoilt for choice, if you want strawberries at christmas you can have them, but this has come at a cost. 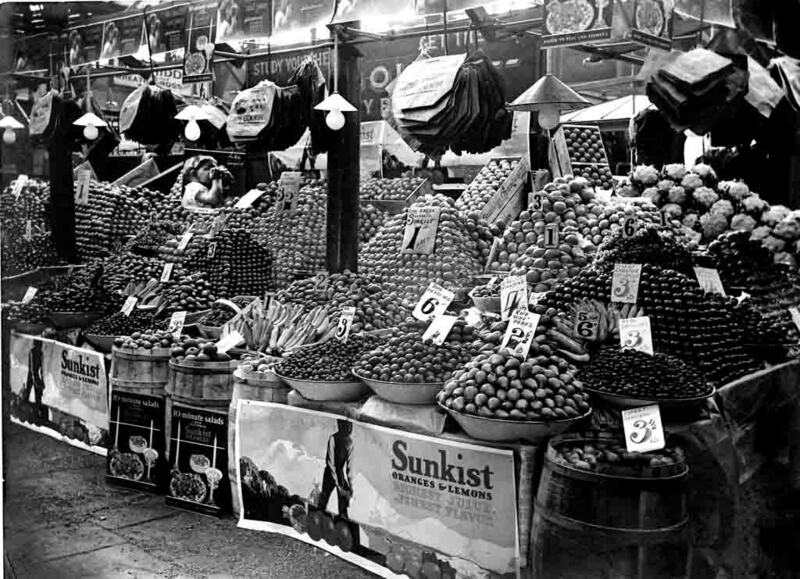 And just to give you a little idea of what we are missing today this was Jim Goughs pre-war fruit stall . I can honestly say, I think myself most fortunate to have seen the markets in their prime. full of atmosphere, and pageantry. 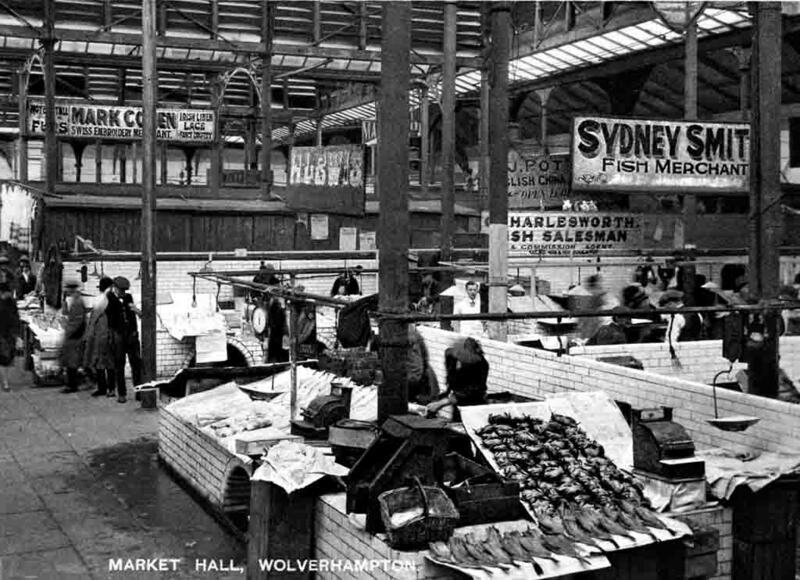 Stalls passed down through generations of the same families, selling every variety of household needs, the likes of which I doubt we will ever see again. 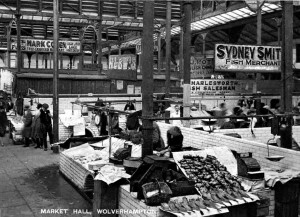 It’s hard to believe now, that our parents and theirs before them, trod this same ground, purchased at these same stalls from different generations of the same family. 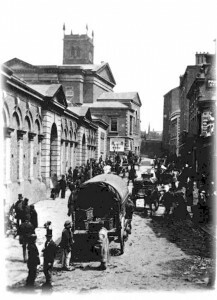 So perhaps this was the factor that made a visit to this market something more than a shopping expedition, a tour of the market in those days was indeed a happy and social occasion.